Released the notification for the recruitment Sub-Inspector post. 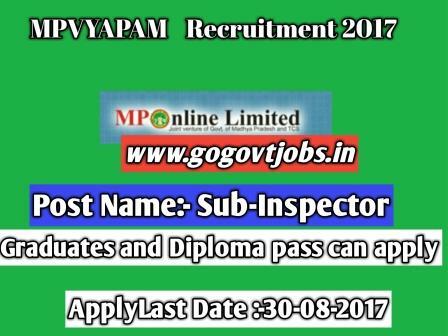 Eligible candidates can apply till 30-08-2017. 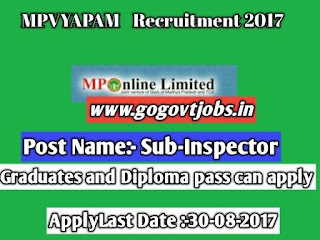 MPVYAM Published notice for recruitment of 611 Sub Inspector post. The candidates can online register at the official postal of MPVYAMP. All the must have pass graduates degree in relevant subject or 3 years diploma. Last date for online application is August 30-08-2017. Education Qualification :- Only those candidates are eligible who have passed these graduate degree in relevant subject oR 3 years diploma in Reorganized University.